Miconia calvescens is a small tree native to rainforests of tropical America where it primarily invades treefall gaps and is uncommon. Miconia is now considered one of the most destructive invaders in insular tropical rain forest habitats in its introduced range. It has invaded relatively intact vegetation and displaces native plants on various islands even without habitat disturbance. Miconia has earned itself the descriptions “green cancer of Tahiti\" and “purple plague of Hawaii\". 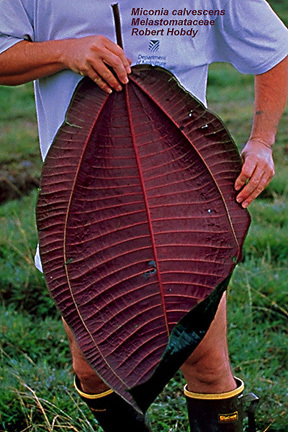 More than half of Tahiti is heavily invaded by this plant. 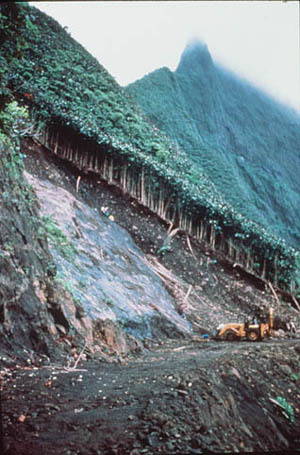 Miconia has a superficial root system which may make landslides more likely. It shades out the native forest understorey and threatens endemic species with extinction. Miconia calvescens is a woody invasive shrubby tree capable of reaching 15m in height; however the majority of specimens in the Society Islands are 6 to 12m tall, with slender, vertical stems (Meyer 1996). The leaves are opposite, elliptic to obovate, usually 60 to 70 cm long (sometimes up to one meter long). A prominent feature of the leaves is the three prominent longitudinal veins. The bicolorous form of the plant has dark green leaves on top with iridescent purple undersides. The inflorescence is a large panicle comprised of 1000 to 3000 white or pink flowers. Berries are 6-7 mm in diameter and purple to black coloured when ripe. In a laboratory, some seeds germinate within 15 to 20 days when exposed to light and moisture, but others remain dormant (Meyer 1996). Data from Maui suggest that seed banks lie largely dormant under normal shaded conditions but are stimulated by the opening of the canopy (HEAR 2005). Laboratory experiments indicated that the seeds of M. calvescens are able to germinate in a large range of light conditions (even at 0.02 % of full sun and at R/FR = 0.5) but not in complete dark (Meyer 1994, in Meyer & Malet 1997). Moisture is a limiting factor and viability decreases rapidly when seeds are stored in dry conditions (Meyer 1994, in Meyer & Malet 1997). The soil seed bank may reach greater than 50 000 seeds/m². Longevity of the soil seed bank in Raiatea (French Polynesia) has been documented to reach at least 15 years (Meyer pers. comm., in Hester et al. 2010). The success of Miconia calvescens as an invasive plant is partly due to its prolific reproduction, with one mature tree flowering up to three times per year and bearing\r\nup to 200-300 inflorescences that can produce more than 200 fruits each with 25 to 200 seeds per fruit (Medeiros et al. 1997; Meyer 1998a). Under favorable conditions, juvenile specimens can grow up to 1.5 meters per year (Meyer and Malet 1997) and reproduce when four to five years old (Meyer 1996). Full-sized trees (greater than eight meters tall) can flower two to three times a year and producing about two to three million seeds each time; flowering appears to be triggered by weather conditions (Medeiros et al. 1997). A young tree with only two panicles can produce ca. 200,000 seeds in its first fruiting season, whereas an older tree with over 50 panicles can produce over 5 million seeds per annum (Meyer 1998b). Production of a large amount of seeds and their remarkable longevity of up to 15 years or more (Meyer pers. comm., in Hester et al. 2010) results in the availability of seeds in the seed bank for germination when conditions are optimal. In addition, the large quantity of seeds enables easy dispersal by humans and other animals. Bird dispersal is overwhelming the most important mode of dispersal at the local level, but transport by humans has repeatedly led to large jumps in miconia distribution (e.g. Murphy et al. 2008b). Miconia calvescens plants can tolerate otherwise poor growing conditions if adequate moisture is available. Transportation of dirty machinery and vehicles to the remote islands of Nuku Hiva and Fatu Hiva (Marquesas Islands, French Polynesia) is suspected to have spread Miconia calvescens. It was also introduced to the island of Tahaa (French Polynesia) in the early 1980s, probably with infested soil on the wheels of bulldozers used for road construction (Meyer 1998b).Miconia calvescens has been and is present in botanical gardens around the world.Miconia calvescens seeds or seedlings may be transported along with soil to new locations (Meyer & Malet 1997). Recommended citation: Global Invasive Species Database (2019) Species profile: Miconia calvescens. 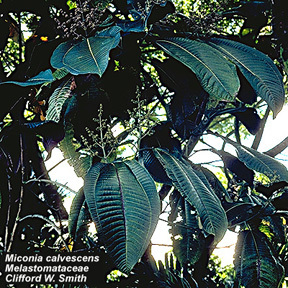 Downloaded from http://www.iucngisd.org/gisd/speciesname/Miconia+calvescens on 21-04-2019. Hawaii is home to a great number of rare and endemic plant, bird and invertebrate species at risk of global extinction, including over 350 federally endangered species. Upper Kipahulu Valley of Haleakala National Park on Maui, Hawaii, is a prime stronghold of Hawaiian biodiversity, containing stands of ohia (Metrosideros polymorpha) and koa (Acacia koa) that provide the primary habitat for rare native Hawaiian plants, birds and insects. 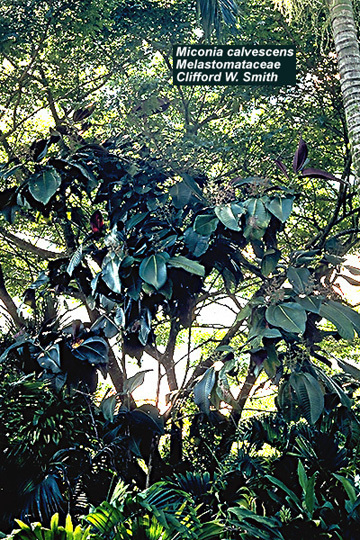 Proactive response of Haleakala National Park personnel originally triggered a community-wide response to the miconia invasion in Hawaii about 30 years after M. calvescens had first been introduced to the State. Integrated management: Combining physical removal with chemical treatment has been employed to control miconia in the Society Islands. Trees (greater than four to five meters) were cut with a machete or a small chain saw and herbicide was systematically applied to the exposed stumps to prevent resprouting. After several trial with different herbicides, Gbnoxone (Triclopyr + 2,4-D) in diesel solution (one liter per 20 liters) applied carefully to cut stumps provided effective control with few resproutings compared with other chemicals used. 2,4-D is also said to be one of the most acceptable chemicals from an environmental point of view since it is not residual (Meyer & Malet 1997). Informations on Miconia calvescens has been recorded for the following locations. Click on the name for additional informations. Badenes-Perez, Francisco R.; Johnson, M. Tracy., 2007. Ecology and impact of Allorhogas sp (Hymenoptera : Braconidae) and Apion sp (Coleoptera : Curculionoidea) on fruits of Miconia calvescens DC (Melastomataceae) in Brazil Biological Control. 43(3). DEC 2007. 317-322. Badenes-Perez, Francisco R.; Johnson, M. Tracy., 2007. Ecology, host specificity and impact of Atomacera petroa Smith (Hymenoptera : Argidae) on Miconia calvescens DC (Melastomataceae) Biological Control. 43(1). OCT 2007. 95-101. Badenes-Perez, F.R. & Johnson, M.T. 2008. Biology, herbivory, and host specificity of Antiblemma leucocyma (Lepidoptera: Noctuidae) on Miconia calvescens DC. (Melastomataceae) in Brazil. Biocontrol Science and Technology, 18: 183-192. Burckhardt, Daniel; Morais, Elisangela G. F.; Picanco, Marcelo C., 2006. Diclidophlebia smithi sp n., a new species of jumping plant-louse (Hemiptera, Psylloidea) from Brazil associated with Miconia calvescens (Melastomataceae). Mitteilungen der Schweizerischen Entomologischen Gesellschaft. 79(3-4). 2006. 241-250. Burnett, K.M., B.A. Kaiser, and J.A. Roumasset. 2007b. Invasive species control over space and time: Miconia calvescens on Oahu, Hawaii. Journal of Agricultural and Applied Economics 39: 125-32. Chimera, Charles G., A.C. Medeiros, Lloyd L. Loope and Robert H. Hobdy., 2000. Status of Management and Control Efforts for the Invasive Alien tree Miconia calvescens DC (Melastomataceae) in Hana East Maui. Conant, P., & G. Nagai. 1998. 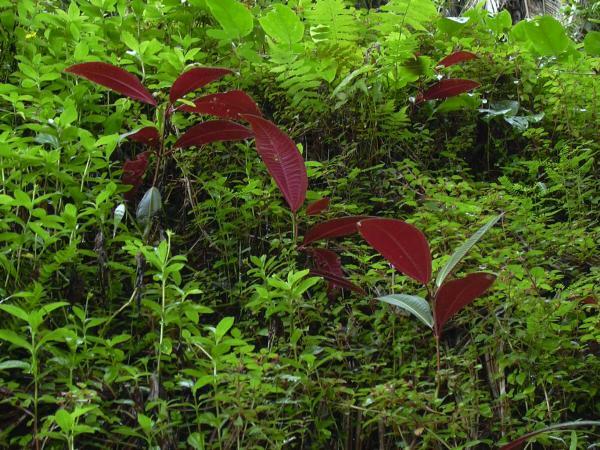 Control of infestations originating from single Miconia calvescens plants on O�ahu and Kaua�i, Hawai�i. In Meyer & Smith (eds. ), 1998, Proceedings of the First Regional Conference on Miconia Control (August 26-29, 1997), pp. 31-44. Conant, P., Medeiros, A. C. and Loope, L. L. 1997. A multi-agency containment program for miconia (Miconia calvescens), an invasive tree in Hawaiian rain forests in Luken, J. and Thieret, J. (eds. ), Assessment and Management of Invasive Plants. Gooding, J., T. Penniman, and L. Loope. 2007. Results of accelerated efforts for management of Miconia calvescens on Maui, Hawaii: 2003-2006. Abstract of poster presentation at 9th International Conference on the Ecology and Management of Alien Plant Invasions, Perth, Western Australia, 17-21 September, 2007. Hester, S.M., S.J Brooks, O.J. Cacho, and F.D. Panettta. 2010. Applying a simulation model to the management of an infestation of Miconia calvescens in the wet tropics of Australia. Weed Research, 50(3): 269 � 279. Loope, L. L. 1997. Harmful Non-indigenous Species (HNIS) report for Micona calvescens. HEAR website. Mack, R.N., and S.K. Foster. 2009. Chapter 3, Eradicating Plant Invaders: Combining Ecologically-Based Tactics and Broad-Sense Strategy. In Inderjit (ed. ), Management of Invasive Weeds, Springer-Verlag, New York, pp. 35-60. Summary: Eradication (failure) case study for Miconia calvescens on Maui, Hawaii, pp. 46-49. Medeiros, A.C., Loope, L. L., Conant, P. and McElvaney, S. 1997. Status, ecology, and management of the invasive tree Miconia calvescens DC (Melastomataceae) in the Hawaiian Islands in Records of the the Hawaii Biological Survey for 1996, Evenhuis, N. L. and Miller, S. E. (eds. ), pp. 23-35. Bishop Museum Occasional Papers No. 48. Meyer, J. -Y. and Malet, J.-P. 1997. Study and Management of the alien invasive tree Miconia calvescens DC. (Melastomataceae) in the islands of Raiatea and Tahaa (Society Islands, French Polynesia): 1992-1996. Technical Report 111, Cooperative National Park Resources Studies Unit, University of Hawai i at Manoa. Meyer, J. -Y. and Smith, C. W. 1997. Actes de la Premi�re Conf�rence R�gionale sur la Lutte contre Miconia (26-29 ao�t 1997), Proceedings of the First Regional Conference on Miconia Control (26-29 August 1997). HEAR website. Summary: Proceedings (in French and English). Meyerson, L.A. & Reaser, J.K. eds. 2003 The Ecological and Socio-Economic Impacts of Invasive Alien Species on Island Ecosystems: Results of an Experts Consultation. Washington, DC: The Global Invasive Species Programme (GISP) on behalf of the Convention on Biological Diversity. Available from: http://www.hear.org/pier/species/miconia_calvescens.htm [Accessed 5 February 2003]. Seixas, C. D. S; Barreto, R. W.; Freitas, L. G.; Monteiro, F. T; Oliveira, R. D. L, 2004a. Ditylenchus drepanocercus rediscovered in the Neotropics causing angular leaf spots on Miconia calvescens Journal of Nematology. 36(4). DEC 2004. 481-486. Seixas, C. D. S; Barreto, R. W.; Matsuoka, K., 2002. First report of a phytoplasma-associated witches broom disease of Miconia calvescens in Brazil. Plant Pathology (Oxford). 51(6). December 2002. 801. Seixas, Claudine Dinali Santos; Barreto, Robert Weingart; Freitas, Leandro Grassi; Maffia, Luiz Antonio; Monteiro, Fernanda Testa., 2004b. Ditylenchus drepanocercus (Nematoda), a potential biological control agent for Miconia calvescens (Melastomataceae): host-specificity and epidemiology Biological Control. 31(1). September 2004b. 29-37. Smith, C.W. 1998. Botany Department, Hawaiian Alien Plant Studies. The search for Biological Control of Miconia calvescens. Thomas, P. March 2000. Considerations and Protocol For Miconia Field Crew. Summary: Precautions to take when working in Miconia infested areas. Thomas, P. May 2000. Miconia calvescens (Melastomataceae). Summary: A comprehensive list of links for further information. Wise, A. and Lyons, R. E. 1998. Velvet tree: Miconia calvescens. Plant Conservation Alliance, Alien Plant Working Group. Allison, Steven D.; Vitousek, Peter M. , 2004. Rapid nutrient cycling in leaf litter from invasive plants in Hawai i. Oecologia (Berlin). 141(4). December 2004. 612-619. Csurhes,S. 2008. Miconia Miconia calvescens. Pest plant risk assessment, Queensland Government, Department of Primary Industries and Fisheries, Brisbane, 14 pp. Florence J. Chevillotte H. Ollier C.& Meyer J.-Y. 2007. Miconia calvescens.Base de donn�es botaniques Nadeaud de l Herbier de la Polyn�sie fran�aise (PAP). Gagn�, B.H., L.L. Loope, A.C. Medeiros and S.J. Anderson. 1992. Miconia calvescens: a threat to native forests in the Hawaiian Islands (Abstract). Pacific Science, 46: 390�91. Gargominy, Olivier. , 2008. Beyond the alien invasion: A recently discovered radiation of Nesopupinae (Gastropoda : Pulmonata : Vertiginidae) from the summits of Tahiti (Society Islands, French Polynesia) Journal of Conchology. 39(Part 5). JUN 2008. 517-536. Goldenberg, R. Miconia calvescens. Base de Dados Tropical. Summary: Fact sheet (in Portuguese). Kairo, M., B. Ali, O. Cheesman, K. Haysom & S. Murphy. 2003. Invasive Species Threats in the Caribbean Region: Report to The Nature Conservancy. CAB International, Trinidad & Tobago and UK. Kaiser, B. A. 2006. 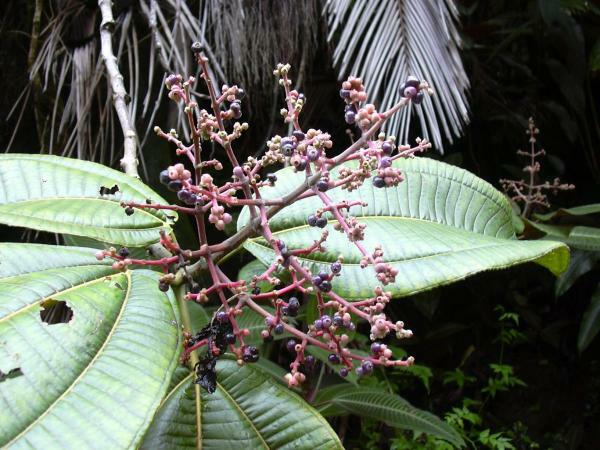 Economic impacts of non-indigenous species: Miconia and the Hawaiian economy. Euphytica. 148(1-2). MAR 2006. 135-150. Le Roux, Johannes J.; Wieczorek, Ania M. , 2008. Isolation and characterization of polymorphic microsatellite markers from the velvet tree, Miconia calvescens DC. (Melastomataceae). Molecular Ecology Resources. 8(5). SEP 2008. 961-964. Le Roux, Johannes J.; Wieczorek, Ania M.; Meyer, Jean-Yves., 2008. Genetic diversity and structure of the invasive tree Miconia calvescens in Pacific islands. Diversity & Distributions. 14(6). NOV 2008. 935-948. Loope, L.L., F. Starr, and K.M. Starr. 2004. Protecting endangered plant species from displacement by invasive plants on Maui, Hawaii. Weed Technology 18:1472-1474. Maui Invasive Species Committee, 2009. Pulling it all Together , the 2009 International Miconia Conference, May 4-7, Maui, Hawaii: Program. Meyer, Jean-Yves., 1996. Status of Miconia calvescens (Melastomataceae), a dominant invasive tree in the Society Islands (French Polynesia) Pacific Science. 50(1). 1996. 66-76. Meyer, Jean-Yves, 1998. Observations on the reproductive biology of Miconia calvescens DC (Melastomataceae), an alien invasive tree on the island of Tahiti (South Pacific Ocean). Biotropica. 30(4). Dec., 1998. 609-624. Meyer, Jean-Yves; Florence, Jacques. , 1996. Tahiti s native flora endangered by the invasion of Miconia calvescens DC. (Melastomataceae) Journal of Biogeography. 23(6). 1996. 775-781. Meyer, J.-Y., 1996. Status of Miconia calvescens (Melastomataceae), a dominant invasive tree in the Society Islands (French Polynesia) Pacific Science, 50(1). 1996: 66-76. Meyer, J.-Y. 1998b. Epidemiology of the invasion by Miconia calvescens and reasons for a spectacular success. In Meyer & Smith (eds. ), 1998, Proceedings of the First Regional Conference on Miconia Control (August 26-29, 1997), pp. 4-26. Meyer, J.-Y., and A.C. Medeiros. 2010. Melastomes. In D. Simberloff and M. Rejm�nek (Eds. ), Encyclopedia of Biological Invasions. University of California Press, Berkeley. Meyer, J.-Y., Florence, J., & Tchung, V. 2003. The endemic Psychotria (Rubiaceae) of Tahiti (French Polynesia) threatened by the invasive Miconia calvescens (Melastomataceae): status, distribution, ecology, phenology and conservation. Revue d Ecologie (La Terre et la vie), 58, 161-185. Meyer, J.-Y. & J. Florence , 1996. Tahiti s native flora endangered by the invasion of Miconia calvescens DC. (Melastomataceae) Journal of Biogeography. 23(6). 1996. 775-781. Murphy, Helen T.; Hardesty, B. D.; Fletcher, C. S.; Metcalfe, D. J.; Westcott, D. A.; Brooks, S. J. , 2008. Predicting dispersal and recruitment of Miconia calvescens (Melastomataceae) in Australian tropical rainforests Biological Invasions. 10(6). AUG 2008. 925-936. Murphy, H. T; Metcalfe, D. J; Bradford, M. G; Ford, A. F; Galway, K. E; Sydes, T. A; Westcott, D. J. 2008a. Recruitment dynamics of invasive species in rainforest habitats following Cyclone Larry. Austral Ecology. 33(4). JUN 2008. 495-502. The Plants Database, Version 3.1 Miconia calvescens DC. National Plant Data Center. USDA, ARS. 2009. Taxon: Miconia calvescens DC. National Genetic Resources Program. Germplasm Resources Information Network - (GRIN) [Online Database]. National Germplasm Resources Laboratory, Beltsville, Maryland. USDA, NRCS. 2009. Miconia calvescens DC. velvet tree. The PLANTS Database (http://plants.usda.gov, 1 June 2009). National Plant Data Center, Baton Rouge, LA 70874-4490 USA.